There… that felt good. So why does Romney bring out the Mr. Bill in me? After all, the former Massachusetts governor is a smart, upright, capable, authoritative fellow in his own ruggedly preppie, J. Crew-ish sort of way. So what if he looks like one of those seasoned, graying-at-the-temples male models we see in sportswear catalogs? Granted, some of the above bon mots appear to be more insensitive and oafish than they were in their original context. But there’s a pattern here… a pattern of chronic insulation from the needs of America’s hurting, dispossessed, downsized and endangered middle class… not to mention the actual poor. That’s dangerous, especially during a time of seething anger, despair and potential unrest. The American Dream is failing most of us right now, and the last thing we need is a president who consorts with Donald Trump and essentially tells us to eat cake. Romney is like Thurston Howell III, the merry tycoon marooned on Gilligan’s Island, but without the old boy’s warmth and charm. Sensitivity isn’t among Romney’s more noteworthy traits. We’re looking at a man who drove on a family trip with his dog conveniently strapped to the roof of his car (inside a crate, but still! )… who dismantled and rebuilt companies for profit as if they were made of Lego blocks, without regard for the hapless employees tossed onto the street… who, as a wild-and-crazy adolescent, forcibly snipped the long golden locks of an effeminate classmate and professes not to remember. Can you imagine Lincoln, FDR, Eisenhower or Bush the Elder being so devoid of empathy? Even Bush the Younger would have taken better care of his dog and shed a tear for the outcast employees (though I could see him snipping a classmate’s hair in the spirit of youthful overexuberance). 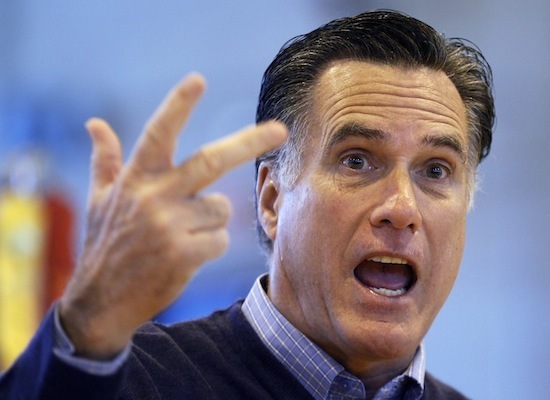 Was Romney the worst of the Republican candidates this year? Of course not; his competition was, for the most part, a procession of jaw-droppingly shallow and maladroit aspirants to the American throne. But let me say this much in their favor: as right-wing Christian populists, at least the Rick Perrys, Michele Bachmanns and Herman Cains could truthfully say they represented more than one percent of the population. Romney can’t. Still, we can rest a little easier knowing that America won’t become a Middle-Eastern style theocracy anytime soon. Romney is the kind of moderate who gives moderates a bad name. He waffles, he flip-flops, he tailors his utterances to the audience whose votes he needs at the moment — even going as far as to distance himself from his own healthcare reforms as governor of Massachusetts. In short, as Gertrude Stein once said about Oakland, California, “There’s no there there.” This purported centrist lacks a center, a core of principle and conviction beneath the slick veneer of his “whatever works” operating style. So who might have made a better nominee than Romney? How about this one: his name is Charles “Buddy” Roemer, and you can be excused if the name doesn’t ring a bell. His resume makes him look like a Southern-fried Romney: former one-term governor of Louisiana, banking executive, Harvard degree (two of them, in fact — including the indispensable MBA). Unlike Romney, the 68-year-old Roemer is a diminutive fellow with a grandfatherly air, a heart condition and a down-home Louisiana drawl. He’s quick and animated and lacks presidential gravitas, but he continually sounds the right notes. Put an end to partisan bickering. Do something about our convoluted tax code. Solve the student debt crisis. But mostly this: get money out of politics. Roemer is justly furious with the sinister alliance between big money and American politicians, something few if any other candidates (including Obama) have mentioned because, hey, they need the money. In fact, Roemer refused to collect contributions of more than $100 and wouldn’t allow a “superPAC” to fund his campaign — which probably explains why he never garnered enough support to mount the stage at all those clownish GOP debates. No friend of party machines, Roemer switched from the Democrats to the GOP a few decades ago and, when it became apparent that the Republicans wouldn’t play ball with him this past year, bolted and ran as a Reform Party candidate. But today, in the wake of Romney’s over-the-top delegate count, Roemer announced that he’s giving up the chase. Too bad. In its time of need, America could have used a Buddy — in this case, an unconventional, outspoken, even radical moderate who’s unafraid to confront the high-placed puppeteers who pull the strings of our government.